Located in Brooklyn, NYC, Coney Island is a peninsular New York City neighborhood that is best known for its entertainment area, featuring two incorporated amusement parks along with a number of independently owned attractions. The area now known as Coney Island was originally part of the early Dutch colony of New Amsterdam. It was referred to as Conyne Eylandt by early settlers, a name that may have referred to its wild rabbit population. Prior to the 1920s, the 4-mile-long neighborhood was one of the outer barrier islands of Long Island, separated from Brooklyn by Coney Island Creek, but the creek was filled in as part of the area’s commercial development, turning it into a peninsula. Coney Island’s roots as an entertainment and resort area date back to 1829 developments by the Gravesend and Coney Island Road and Bridge Company, which built the first bridge across the former creek, as well as the area’s first hotel. Initially, the area was a resort for wealthy New Yorkers, far enough away from Manhattan and Brooklyn’s business and residential districts to provide an illusion of a getaway, but a ferry line opened in 1847 made its beaches a popular destination for lower and middle-class residents as well. In 1868, the Brighton Beach resort was built by William A. Engeman, a reference to Brighton, a popular British resort city. Similar hotels were built throughout the late 19th century, dividing the neighborhood into three main resort areas, Brighton Beach, Manhattan Beach, and West Brighton, which offered bath houses, vaudeville theaters, and attractions such as the 300-foot Iron Tower observation tower, acquired after the 1876 Philadelphia Exposition. The history of amusement parks at Coney Island dates back to the turn of the 20th century, with the opening of Steeplechase Park in 1897, Luna Park in 1903, and Dreamland in 1904. Independent amusements and rides also filled the area’s beaches and resorts, and with the advent of excursion railroads and steamboats, the area became the largest amusement area in the United States, attracting seven million annual visitors. A fire destroyed Dreamland in 1911, however, and after World War II, the area began to decline in popularity, with Luna Park closing in 1946 following a series of fires and Steeplechase Park following in 1964. The area fell into crime and disrepair in the 1960s and 1970s, with several city and commercial revitalization efforts failing before completion. 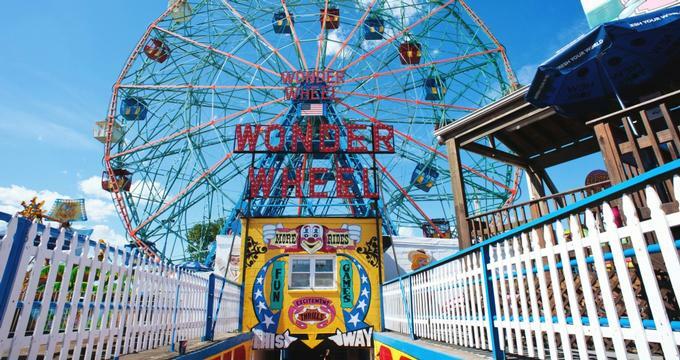 The downturn continued with the 2000 demolition of the historic Thunderbolt roller coaster by mayor Rudy Giuliani, but recent interest in the area by the Coney Island Development Corporation has led to revitalizations, including the reopening of a new Luna Park facility in 2010. A $1.5 billion renovation of the area has been proposed by Thor Equities, including the construction of a Vegas-style hotel. Controversy over the development of the area dates back to its early 19th-century development, with many residents wishing to preserve the area’s beaches as a park space. In the early 1900s, the city condemned all buildings and structures south of Surf Avenue in an attempt to reclaim the neighborhood’s beaches, but opposition from amusement owners resulted in the creation of a city-owned boardwalk marking a development line 1,000 feet south of the avenue. In the 1940s and 1950s, city housing commissioner Robert Moses took notable measures against the amusement area, moving the New York Aquarium to the former Dreamland site and building low-income housing high-rises near the beaches, increasing crime in the area. Opposition to Moses’ plans to demolish all amusements and zone the area as residential-only resulted in current amusement zoning protections of the area 100 feet north of Surf Avenue, between West 22nd Street and the Cyclone roller coaster. Coney Island currently has two theme parks in its amusement area, Deno’s Wonder Wheel Park and Luna Park, although many of its attractions are unincorporated rides. Three rides are protected as National Historic Landmarks: The Wonder Wheel, built in 1918, the Cyclone roller coaster, built in 1927, and the Parachute Jump, a now-defunct 1939 New York World's Fair ride that serves as a landmark for the area, commonly referred to as “Brooklyn’s Eiffel Tower.” The B&B Carousell is the area’s last remaining classic carousel, built in 1906 and restored in 2013. Sideshows by the Seashore offers a revitalization of Coney’s classic circus shows, and the Abe Stark Rink offers seasonal ice skating. In 2014, a new Thunderbolt roller coaster was built by Zamperla in homage to the demolished classic coaster. Visitors can also enjoy bumper cars, traditional haunted houses, and arcade games such as skeeball. A large public beach, bordered by the Riegelmann Boardwalk, stretches from West 37th Street through the central amusement area, running 2.5 miles through Brighton Beach and Manhattan Beach. The New York Aquarium is accessible from the beach and boardwalk, along with a number of famous food shops, including the iconic Nathan’s Famous Hot Dogs. Additionally, a 400-meter public beach stretches into Manhattan Beach, and a private resident-only beach spans the west end of the neighborhood. An annual Coney Island Mermaid Parade is held every summer along the boardwalk, organized by the nonprofit Coney Island USA association. Coney Island USA also runs the Coney Island Film Festival in October and operates the Coney Island Museum. Major concerts and events are held at the Ford Amphitheater, and Brooklyn Cyclones minor league baseball games are hosted regularly at MCU Park, built on the former site of Steeplechase Park.